Use these handy adapters to connect two DB-15HD connectors of the same gender. Choose from Male-Male or Female-Female varieties. 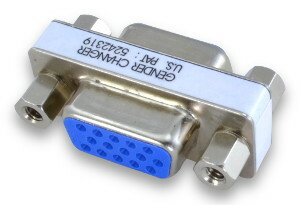 The DB15HD connector is most often found on VGA computer monitor cables and connectors, but can be used for many other applications. Technically, the correct term for the DB15 High Density connector is DE15, so this can also be referred to as a DE15 Gender Changer. Sometimes, the terms HD15 and DBHD15 are also used. Pins are connected 1 to 1, 2 to 2, etc. The MGC15HDF and MGC15HDM have all 15 pins connected through. The VGA versions of this product (MGC15HDVF and MGC15HDVM) do not connect pin 9 through since VGA cables do not use pin 9. The compact size of these adapters makes them ideal for tight spaces.